New Delhi, 8th April, 2013. All Chief Commissioners of C.Ex. , Customs& S.Tax. 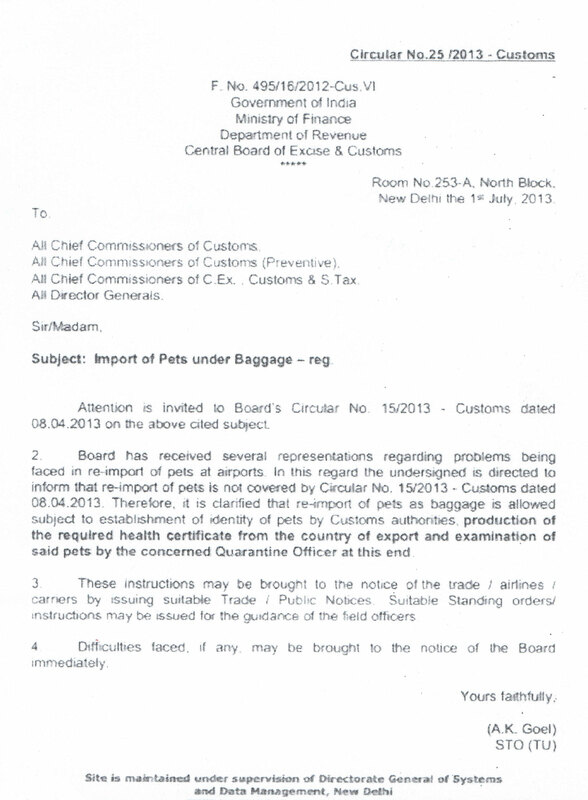 Subject: Import of Pets under Baggage – reg. 1. Attention is invited to Board’s Circular No. 94/2002- Customs dated 23.12.2002 on the above cited subject wherein it was provided that import of pets upto two numbers per passenger may be allowed at one time subject to the production of the required health certificate from the country of origin and examination of the same by the concerned Quarantine officer. 2. Board has re-examined the present policy of import of two pets by passengers in view of representations received in this regard. Accordingly, it has been decided to allow import of two pet animals as baggage only to persons transferring their residence to India after two years of continuous stay abroad in terms of Baggage Rules 1998 subject to production of the required health certificate from the country of origin and examination of said pets by the concerned Quarantine Officer at this end. This new dispensation shall come into force with effect from 15th April 2013. Import of animals (pets) in general would continue to be governed by DGFT policy. 3. Board’s Circular No. 94/2002 - Customs dated 23.12.2002 stands modified accordingly to that extent. 4. These instructions may be brought to the notice of the trade/airlines/carriers by issuing suitable Trade / Public Notices. Suitable Standing orders/instructions may be issued for the guidance of the field officers. 5. Difficulties faced, if any, may be brought to the notice of the Board immediately.